We’d love your help. Let us know what’s wrong with this preview of 1-2-3 Magic by Thomas W. Phelan. To ask other readers questions about 1-2-3 Magic, please sign up. Great parenting book (but I have to admit, I think I have now had my fill for a while on parenting books). I have heard references to this book several times over the years and I finally decided on my sister's recommendation to read it. Unfortunately, we get a few parenting book recommendations... haha. I know if I apply this consistently, it will be positive all around. I have started, but I know I need to be more consistent AND get Eric on board. So here are my notes for me or anyone else who fe Great parenting book (but I have to admit, I think I have now had my fill for a while on parenting books). I have heard references to this book several times over the years and I finally decided on my sister's recommendation to read it. Unfortunately, we get a few parenting book recommendations... haha. 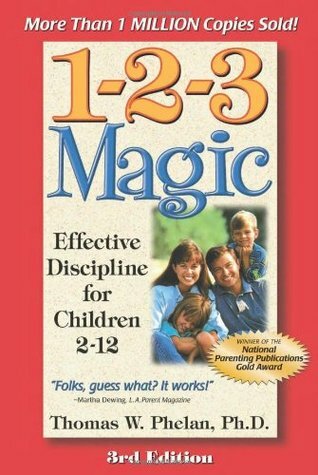 123 Magic is a plan for dealing w/bad behavior that doesn't include yelling or physically intimidating or abusive behavior (which is only likely to help them learn to deal with problems by yelling and physical intimidation since kids model parents). It's easy to make 2 parenting mistakes: too much talking and too much emotion. Kids have a hard time w/ being inferior. My upset is a "big splash" for them. Emotional outbursts accidentally help them feel powerful! Three parenting jobs: 1)Controlling obnoxious behavior. 2) Encouraging good behavior. 3) Strengthening relationship. We deal with STOP behaviors by counting 1,2,3 (including whining, arguing, teasing, tantrums, yelling, fighting, invasive touch, etc... behaviors you want to stop). You don't talk or reason since your children are not little adults... you condition them to stop their behavior by counting 1,2,3 with 5 seconds in between counts. Words and reasons are not effective with young children. A consequence follows if they don't stop by three (including time-out, early bedtime, loss of electronics, no dessert, extra chore, no talking, no friend over, no TV, money fine, write paragraph or "lines"). Punishment should be mild and reasonable (administered by a non-tantruming parent). We deal with START behaviors by giving praise, making simple requests, using a timer, a docking system, natural consequences, charting, and counting variation (start behaviors include cleaning up, being kind, playing nicely, going to bed, doing homework, playing piano, etc.). We STRENGTHEN THE RELATIONSHIP by listening, having one-on-one time together, talking, solving problems, and by managing technology. Routines are necessary for positive outcomes... same time, same place, same way. Morning Routine (up, wash up, dress, eat, leave). Chore chart (or weekly cleanup or pickup before dinner). Homework routine (neat, correct, thorough, no complaining, starting w/o reminder, reading, math). Suggested consequences for major, medium, and minor offenses that require special attention: Grounding 2 wks/1 wk/2 days. Fine $25/$10/$5. Chores 15 hrs/8 hrs/4hrs. Community service 15 hrs/8 hrs/4hrs. Educational activity 8 pg paper/4pg paper/2pg paper. Format for a one-on-one meeting... "We have a problem... what do you think? What can we do? How can I help?" (pretty much same agenda for family meeting... we have a problem... How do we sove this?... This is our solution... post on fridge... next). "Childhood is a period of transitory psychosis." They are born unreasonable and selfish. My job is to help them learn frustration tolerance (while being gentle, consistent, decisive, and calm). "I'm a wild animal trainer." Choose method and apply until "trainee" does desired action. Awful book. Their method is all about eliminating "problem" behavior. And yes, I suppose the method is good at stopping a behavior you don't like once the child starts doing it. But the child only stops the behavior because they're threatened with a punishment and they don't want the punishment. Not because they're being taught the correct way to behave instead. The book doesn't at all address teaching the child to have their own self-discipline when an adult isn't around to monitor their behavi Awful book. Their method is all about eliminating "problem" behavior. And yes, I suppose the method is good at stopping a behavior you don't like once the child starts doing it. But the child only stops the behavior because they're threatened with a punishment and they don't want the punishment. Not because they're being taught the correct way to behave instead. The book doesn't at all address teaching the child to have their own self-discipline when an adult isn't around to monitor their behavior. It doesn't at all address trying to find the root cause of the behavior to figure out why the child was behaving that way in the first place and teaching the child to express their needs/wants in a more appropriate manner. There's only a brief chapter at the end about active listening and even in that chapter they mention threatening a timeout if the child starts to get too worked up during the conversation. This book is all about using punishments and rewards to control your kids behavior and not at all about compassionately and kindly disciplining your kids and teaching them how to have their own self-discipline. How in the world do you begin to discipline a young child? When they get older, it's easy: no TV, no dessert, no play time with friends. But what about when all they do is run around and torment the place? Enter "1-2-3 Magic". It has a simple premise. Tell the child to stop doing something. If he doesn't stop, "that's one". Give him until three, with about five seconds in between one and two. On three, he's off to his room or isolated in a chair for a minute or two. When the timeout is complete, How in the world do you begin to discipline a young child? When they get older, it's easy: no TV, no dessert, no play time with friends. But what about when all they do is run around and torment the place? Enter "1-2-3 Magic". It has a simple premise. Tell the child to stop doing something. If he doesn't stop, "that's one". Give him until three, with about five seconds in between one and two. On three, he's off to his room or isolated in a chair for a minute or two. When the timeout is complete, everything is back to normal. No lectures on why daddy did this or asking if you learned your lesson. With my child, it took about four times. He now obeys before I get to "two". It was amazing. Consistency is the key. Also parents need to understand something called the "Little Adult Assumption". This is the misguided belief that little kids have hearts of gold and are reasonable and unselfish. They're quite the opposite. It was eye-opening when I started looking at my son this way instead of a small version of me. The book is broken down into Start Behaviors and Stop Behaviors. For me, the Start Behaviors will be addressed when he's old enough to do homework, clean his room, etc. Right now it's important to have him stop doing something. The book also contains lots of information on positive feedback (don't just give your child attention when he's bad) and how to handle their attempts at manipulation. I was a skeptic. There is no "magic" in childrearing, and while I was desperate enough to seek discipline help, I wasn't expecting to find it. They've made a convert out of me! This book really works. In a nutshell, stop talking so much when you discipline your kids! We are very guilty of this transgression. Our curious kid wants to know about everything and is firmly entrenched in the "why?" phase. So it was natural for us to also explain why you can't put your feet on the table/hit someone/whin I was a skeptic. There is no "magic" in childrearing, and while I was desperate enough to seek discipline help, I wasn't expecting to find it. They've made a convert out of me! This book really works. In a nutshell, stop talking so much when you discipline your kids! We are very guilty of this transgression. Our curious kid wants to know about everything and is firmly entrenched in the "why?" phase. So it was natural for us to also explain why you can't put your feet on the table/hit someone/whine incessantly, and why you have to brush your teeth/go to bed/wait your turn. We also know how much children learn through repetition, so we'd continue to expound on these themes ad nauseum. He was sick of it, we were sick of it, and it was not working. So, this book taught to give him a little more credit and shut up. We tell him one time (per episode) what the rule is and why that is the rule, and after that there is no negotiating or further explanations. End of story. "This will never work," we whispered to each other. It worked! It worked! We can all live together again! We will definitely be revisiting this book as he gets older (we bought our own copy). I recognized many things in here that would have worked on me, especially in those troublesome teen years. For example, you don't do your chores? That's fine, but since you outsourced it (to a parent), your allowance is docked for that task. Or, back to the overexplaining: to me it was like the more times my parents said something, the weaker their argument was. In my eyes their explanation meant tey were having to justify it and prove it to me, therefore it was not valid. I think I would have responded better if it was a one and done situation. I have to say this again: I can't believe it worked! It worked! So glad I didn't waste my money and purchase this book. Very grateful to libraries for this very reason. This book is a recommended read by our local Children's Hospital. I do not have discipline issues with my children, and for the most part, it is because I don't use this nonsense. I can see where this method would create some huge discpline problems where there wasn't any before, or even compound and make things worse if there is a discipline problem. This technique only provides children the So glad I didn't waste my money and purchase this book. Very grateful to libraries for this very reason. This book is a recommended read by our local Children's Hospital. I do not have discipline issues with my children, and for the most part, it is because I don't use this nonsense. I can see where this method would create some huge discpline problems where there wasn't any before, or even compound and make things worse if there is a discipline problem. This technique only provides children the permission and opportunity to push the limits and boundaries, even going past limits and bounderies, by giving them repeated warnings before a consequence is finally inflicted. Does not prepare children to function in the real world, nor does it teach them responisibility for their actions. The theme repeatedly through this book is "I as your parent, am going to enable you to push as far as you can in rule breaking before I issue a consequence." This is more of a power struggle game that actually gives the child the upper hand. I also just dislike the framing of children as little manipulators. I’m not saying they don’t manipulate…I think they do, sometimes, just like everyone does. But I think far, far more behavior than we realize is not driven by an intention to manipulate; it’s a matter of not having the skills they need to communicate, ask for what they need, and function appropriately in the family. (I’m much more aligned with Ross Greene’s “Explosive Child”/lagging skills approach than the 1-2-3 Magic one, I think.) So much of what the book calls “Stop” behavior looks like “child having a hard time” behavior to me. Phelan makes this big deal about how we shouldn’t think of kids as being miniature adults, and I think that’s spot on - we shouldn’t, but part of what being a child (and not a miniature adult) means is that you don’t have all of the skills that an adult has, and someone needs to TEACH THEM TO YOU. Coaching is absolutely part of what parenting is, and what discipline is. (“Discipline” comes from “teaching”, not from “punishing”, etymologically, and I’m not one to lean on etymology too hard, but I think it’s important to remember what “discipline” is and what it isn’t.) How does the child learn any coping strategy other than “stuff it” under the 1-2-3 Magic approach? Respect, too, is something I feel is almost nonexistent in this book. Yes, as the parents it’s our job to set the rules and to discipline, and kids need to respect us and listen to us, but how are they going to learn to do that if we never listen to and respect THEM (in an age-appropriate way, of course), if we just shut them up with counting when they question us? That doesn’t feel even remotely respectful to me. The tone throughout talks about kids as “brats” and “little devils” - not respectful at all. And I was SERIOUSLY bugged by some of the examples of the book where parents were doing a “good job!” of using the 1-2-3 Magic skills. It felt like the kids weren’t allowed to do anything other than immediately obey without complaint. I’m not aiming for that kind of authoritarian dictatorship…and I don’t think that’s going to lead to a kid who’s a good, functional, independent member of a society that’s NOT a dictatorship, down the road. Another random thing: in the discussion of natural consequences in relation to Morning Routines (kids want to go to school, will be upset if they’re late more than a few times), there is NO discussion of how kid’s lateness causes parental lateness. Why does no one ever talk about this? Do most adults have jobs where it doesn’t matter if they get there twenty minutes late?? I mean, I teach when I teach, I can’t just show up late because M decided to be a slowpoke one morning! I mean, obviously that particular natural consequence is not one I’ll be taking advantage of for that reason, but seriously, it boggles my mind how often that natural consequence is suggested without any acknowledgement that kids being late means parents are late, too. Like, I’ve never, ever seen anyone who suggests that particular natural consequence mention the parental lateness aspect of it, and then I end up feeling like I’m some sort of alien for thinking about it. "I love my children, now if I could just like them as well." I have 4 children under age 8. I get it. I love them, I just wish I spent more time playing games and chatting and really teaching and helping my kids rather than lecturing and scolding and correcting and reminding and stopping them all day. - "But it's our duty to teach our kids responsibility, and to get along, and to be nice, and to play fair" Yeah we all know that, but there has to be a better way. Kids will grow up, and they'll likely be just fine, but will we miss them? Will we cherish the memories of daily good times, or just those few fleeting moments or vacations? 1-2-3 Magic teaches the counting system - but only for things you want children to STOP doing. Stopping something bad takes seconds. Doing something right takes minutes to hours to days. So you can't use counting for making their bed, or cleaning their room, or eating their dinner. You only count for behaviors you want them to STOP. Next big revelation - you don't lecture. You don't talk or show any real emotion in moments of discipline. When they are acting out - you count them. "That's one." Then you just wait. If they honestly don't know what they did wrong, you say one sentence to explain. Usually they know but they feign ignorance - "WHAT'D I DO?!" You count, and that's all. You don't say "That's One! I told you to stop touching your sister, why do you have to keep buggin her, can't you just sit and eat your dinner like everyone else? Do you really want to go to your room? (kid continues) THAT'S TWO. Don't make me do it. I will send you to your room. Do you see your sister bugging anyone? Why can't you be like her? Why do you have to make everything so difficult? Are you trying to drive me Crazy? (kid continues) THAT'S IT. THREE! Let's go. Get upstairs NOW! I've had it - I've just had it.!" This book is great because the examples are real. I could see my kids and hear myself in the different conversations. It was sad and scary to think of how much time and breath I've wasted lecturing my kids when there was no chance they were going to hear it. I picked up Phelan's 1-2-3 Magic after having it recommended by my son's paediatrician. I was not entirely sure what to expect, as many people have told me that parenting, even discipline, is not rocket science. Truth be told, it had become a daunting and somewhat overwhelming task for me and I thought that if anything could help, I'd give it a try. Phelan chooses to break the book (and the system) down into three digestible portions: dealing with obnoxious behaviour, creating and sticking with I picked up Phelan's 1-2-3 Magic after having it recommended by my son's paediatrician. I was not entirely sure what to expect, as many people have told me that parenting, even discipline, is not rocket science. Truth be told, it had become a daunting and somewhat overwhelming task for me and I thought that if anything could help, I'd give it a try. Phelan chooses to break the book (and the system) down into three digestible portions: dealing with obnoxious behaviour, creating and sticking with routines, and strengthening parent-child relationships. He presents the system not as anything overly complex, but sometimes overlooked in the hustle and bustle of the every day life of a parent. By using basic techniques to tackle STOP behaviours (read: obnoxious), Phelan empowers the parent with a counting system sure to reap rewards if handled effectively. He differentiates this from START behaviours (things that need to be part of a regular routine or that NEED doing) by setting up praise, organising time limitations, injecting consequences, and following through in an emotionally neutral manner. All this, while continuing to foster the needed relationship with children so that they not only respect you as the parents (and not only for your disciplinarian skills) but also as a fellow human being. In a few short hours, any parent can be well on the way to better control of the situation and keep the emotional waves from crashing down on top of the household. Phelan lays it all out and makes it fun to learn. The techniques Phelan professes are not anything you'd likely not agree with from the outset, but it is always better to see them supported with explanations and examples rather than off the cuff comments from other parents as they roll their eyes. The book is a wonderful tool to help build up parental confidence as well as structuring the household in a calm and level-headed manner. Parents and children alike will surely benefit from the skills and options presented in the twenty-five chapters, although neither may be as energetic in the early days. Empowerment is key, while respect is also an essential part of Phelan's program and it can all be done in a few weeks, with willing parental participants. With easy to understand explanations and no psychobabble, Phelan is able to sell the idea quite easily and helps parents retain control of the household, while not appearing overly dictatorial and frigid. Not the case with this super quick read "1-2-3 Magic". It is a quick read and, because they only focus on three things, it's a quick implement. I admit to being skeptical - I have always mocked the parents who count, "1, 2, 3" realizing, as their kids do, that they are begging, not parenting. But this book really points out the difference in implementing the "count" (namely taking the emotion and talking out of it) and I am excited to try it. I can't decide if this book had a poor philosophy or just isn't my parenting style, at all. I had seen quite a few people recommend this book over the years, and thought I'd give it a shot. Honestly, it was the most mundane, typical parenting advice. They spend the first 30 pages repetitively stating that you'll be saying "1-2-3 Magic!" after you read the book, you'll be so amazed. Then the climax is literally them telling you to count, put your kid in time out when you get to 3, and then don't I can't decide if this book had a poor philosophy or just isn't my parenting style, at all. I had seen quite a few people recommend this book over the years, and thought I'd give it a shot. Honestly, it was the most mundane, typical parenting advice. They spend the first 30 pages repetitively stating that you'll be saying "1-2-3 Magic!" after you read the book, you'll be so amazed. Then the climax is literally them telling you to count, put your kid in time out when you get to 3, and then don't address the issue afterward - just repeat as needed. Similar to dog training, they state. I cannot believe an entire book was written and devoted to this. The rest of the book offers various ways to tweak this to your child's age, all which seemed pretty intuitive. Recommends it for: Parents of kids, baby sitters, primary teachers, and grandparents even. My wife used to always watch the show Super-Nanny trying get tips for raising our kids. I couldn't stand it. It was 1% information to that load of drama and crazy kids. Bleh. 3) Helping you set aside time to build healthy friendships with your kids. My wife read the book and was so exc My wife used to always watch the show Super-Nanny trying get tips for raising our kids. I couldn't stand it. It was 1% information to that load of drama and crazy kids. Bleh. My wife read the book and was so excited she summarized the info and encouraged me to read it. The book was short an to the point, and here is the important part: it works. Yesterday we took the boys out to eat in public and they totally behaved well. Sure you have to keep an eye on them, like any kid, but now its so much less frustrating since I now have a really solid guide for how to discipline and reward them. One of the most common sense parenting books I have read. It could have been written by a friend. It seems doable in every day life and applicable to most situations...not just textbook ones. We 1,2,3 our toddler to great effect. I don't think I've gotten past two in weeks. A very helpful book. Presents clear format for discipline style. Helpful use of anecdotes but too much promotion of probable success with program. Some good take aways. Easy to implement technique. My son responded well. Book predicted child behaviors well. The back cover of the book, 1,2,3 Magic asks, “Who’s in charge at your house?” If you can’t answer “You, the parent are” , then listen up as we review our latest read. I am sure that over the years you have read several books that describe the best way to discipline children. After several frustrating moments and graying hairs, you might have chosen to just pick and choose methods, trying to see what will finally have an effect. You and I know however, that the real issue is in the simplicity of The back cover of the book, 1,2,3 Magic asks, “Who’s in charge at your house?” If you can’t answer “You, the parent are” , then listen up as we review our latest read. I am sure that over the years you have read several books that describe the best way to discipline children. After several frustrating moments and graying hairs, you might have chosen to just pick and choose methods, trying to see what will finally have an effect. You and I know however, that the real issue is in the simplicity of the method, consistency, and sticking to it. Being persistent. That’s where 123 Magic shines and why we are pleased to recommend the book! This book is a simple book to read, understand, and later apply. Now in its fourth edition, it covers a wide range of issues, such as correcting obnoxious behavior, encouraging good behavior, dealing with more serious issues, and even providing assistance to teachers in their classrooms. The book begins by differentiating between stop and start behavior. Stop behavior includes the frequent but minor behavior such as arguing, screaming, and tantrums. Start behavior includes chores, homework, and sticking to a regular morning and evening routines. The counting procedure that the book is named after, “1,2,3,” is used for stop behavior. The start behavior includes several different tactics outlined in the book such as using a kitchen timer or charts. For correcting both types of behavioral issues, Dr. Phelan emphasizes consistency and removing emotion from the discipline process. This system may be used not only by parents, but grandparents, teachers, and other caregivers after the children have been introduced to the method, for a period of time. We were surprised by how simple his system is to implement. It really is about counting and not yelling, begging, or hitting. Dr. Phelan forbids parents from injecting emotion into their discipline process. He says that children feed off of the emotions of their parents. He calls this the “NO TALK, NO EMOTION” rule. Many parents that open this book might think that their child will not respond to these methods but Dr. Phelan insists that with consistency and proper application of the counting method and using the tactics for start behavior, effective discipline can be implemented in any home. In this now fourth edition of 123 magic, Dr. Phelan has added a dynamite chapter on how parents can handle technology issues (email and internet time, texting boundaries). No other book we have picked up has been able to so efficiently handle this subject. This book is very accessible, written in everyday language without heavy psychology jargon. The chapters are short and may be read in bursts. In fact, many of the paragraphs are simply responses to bold-faced questions in the text, which makes it easier to find an answer to your specific question. The examples of parent and children interactions are extremely practical and the ideas and suggestions for each behavior are doable. This does not require some kind of disciplining certification; it really is simple to adopt these practices immediately in your home. We really thought this discipline method showed respect to children by removing the often belittling lecturing, yelling, and insulting talk children often hear from their parents. One of the three big goals of the 123 method is to improve your relationship with your child, not to just get control. Now for the negatives: One downside to this book was that there seemed to be a lack of emphasis on setting a good example by the parents. He lists over and over again how important it is to avoid the parental tantrums, basically when parents lose control while trying to discipline, but he does not comment on what the children observe in the home. For example, the parents may be calm with their children but perhaps not with other adults. He also states that oppositional defiant disorder and conduct disorders may be created by poor parenting and frankly, we are not sure that is correct. Lastly, the book was poorly edited, in the eBook edition that we read. All in all, we agree that one of the goals of parenting is to improve your relationship with your children. This book certainly does that by providing a simple discipline method, useful to all parents, and respectful behavior towards both parties. This is especially great for parents with children between 2 and 5 years old who are looking to get off to the right start with boundaries and limits as well as encouraging good habits in the home. We give it 5 out of 5 stars. We've had this book sitting on our shelf for a while now, and when my daughter turned 2, I finally decided it was time to read it. I swear, she knew what was up, because when I started reading it, she started acting up. But when I finished the first section (Controlling Obnoxious Behavior), she calmed right back down. Maybe it was because I was implementing the technique? The counting has worked pretty well for us. I rarely make it to 3, which makes me sound like a great parent, but in reality I We've had this book sitting on our shelf for a while now, and when my daughter turned 2, I finally decided it was time to read it. I swear, she knew what was up, because when I started reading it, she started acting up. But when I finished the first section (Controlling Obnoxious Behavior), she calmed right back down. Maybe it was because I was implementing the technique? The counting has worked pretty well for us. I rarely make it to 3, which makes me sound like a great parent, but in reality I say 1, and she often tells me that she needs a time out, and trots off to her room. I think she views it more as a chance to take a breather and work through her emotions than a punishment, which seems pretty healthy to me. We use this a lot more in public, and have had more than one time out at the front of the store, with her bawling her eyes out and me standing there, looking out the window while she works it out. We may get stares, but dang it, she is getting that time out! Offers some good guidance but view of children a bit brow-raising. I appreciated the insights about the necessity of being calm and consistent (following through on what you have said) when it comes to setting standards and consequences for children. However, I was a bit uncomfortable with the author's view of children. Perhaps the author is attempting levity in order to diffuse parental frustration, but for me, his portrayal of children made me squirm in my chair. In a nutshell, Phelan bases his Offers some good guidance but view of children a bit brow-raising. However, I was a bit uncomfortable with the author's view of children. Perhaps the author is attempting levity in order to diffuse parental frustration, but for me, his portrayal of children made me squirm in my chair. In a nutshell, Phelan bases his discipline philosophy on the idea that children are "sort of nuts! They are born unreasonable and selfish, and it is our job...to help them become the opposite. How do you do that? You start by changing your thinking about children. ...instead of thinking of your kids as little adults, think of yourself as a wild animal trainer!" I read this book the first time when my oldest child was a few months short of two and it helped me gain peace of mind, lose my anger and gain patience, but other than that it didn't really help too much. He was still just too young. Since then, my very energetic, loud and curious three and four year olds have started driving me crazy. It was a good time to revisit this book since we're living with my in-laws and they find my children to be intolerable. It definitely helps remind me that kids are I read this book the first time when my oldest child was a few months short of two and it helped me gain peace of mind, lose my anger and gain patience, but other than that it didn't really help too much. He was still just too young. It definitely helps remind me that kids are going to be kids and that there's no point in me getting all emotional and angry about their actions. Simply count them, discipline them and move on. While they need an explanation, they are too young to absorb complicated rules and it overwhelms them. In the few days that I've started counting them using the No-Talking, No-Emotion rule I've regained a LOT of sanity and lost nearly all my anger and impatience. Just as the book promises, I find myself more affectionate toward my children and enjoying them more. This was a short simple book about the 1-2-3 method used to discipline children. My brother is a therapist and has recommended it to a lot of his clients. It is nothing very new or revolutionary but has ideas that sound reasonable to me. It covers the specifics of how to count to 1-2-3 and how it should contain no emotion, no concessions (2 and a half....2 and 3 quarters....etc. ), and that once you put the kid in a time out place, you should have a timer that you set for the number of minutes eq This was a short simple book about the 1-2-3 method used to discipline children. My brother is a therapist and has recommended it to a lot of his clients. It is nothing very new or revolutionary but has ideas that sound reasonable to me. It covers the specifics of how to count to 1-2-3 and how it should contain no emotion, no concessions (2 and a half....2 and 3 quarters....etc. ), and that once you put the kid in a time out place, you should have a timer that you set for the number of minutes equal to his/her age (the book talks a lot about timers which I have found really useful the past couple of months with my son - setting timers to finish dinner, get ready for bed, clean up toys, etc. It makes the timer the villain.) When you take the child out of time out, you are supposed to continue to show now emotion and give no big hugs and most importantly to not explain what they did wrong (unless obviously they really need an explanation but most often then have an idea). I liked this book for some reasons and hated it for others. Like most self-help books, it implies that its strategy is the only way and if you try anything else you and your family are doomed. I can forgive that, i suppose. I mostly wish it had more info for younger kids. It says it 's for ages 2-12 but most of the examples only applies to older kids. It needs a chapter devoted to the little guys! Of course, I wish it had a chapter just for me and the unique circumstances and challenges we experi I liked this book for some reasons and hated it for others. Like most self-help books, it implies that its strategy is the only way and if you try anything else you and your family are doomed. I can forgive that, i suppose. I mostly wish it had more info for younger kids. It says it 's for ages 2-12 but most of the examples only applies to older kids. It needs a chapter devoted to the little guys! Of course, I wish it had a chapter just for me and the unique circumstances and challenges we experience. Not my style of parenting. The book makes it out to seem that time-outs are an effective form of punishment for nearly any misbehavior, and discounts any kind of reasoning with children, saying they are not "little adults" and can't be expected to understand. Most of the book seems to ignore an empathetic approach to parenting, but then it tacks that on at the end in a short little chapter presumably so you can't say it doesn't embrace empathy at all. I think there is value in empathy, and in si Not my style of parenting. The book makes it out to seem that time-outs are an effective form of punishment for nearly any misbehavior, and discounts any kind of reasoning with children, saying they are not "little adults" and can't be expected to understand. Most of the book seems to ignore an empathetic approach to parenting, but then it tacks that on at the end in a short little chapter presumably so you can't say it doesn't embrace empathy at all. I think there is value in empathy, and in simple explanation, even with very young children. Also, while time-outs may be effective in certain situations, I don't think they are always the appropriate response to misbehavior.